I didn’t know anything about Medjool dates until about two years ago. Boy, was I missing out! Sweet and semi-soft with a tantalizing texture, Medjool dates make regular old pitted dates seem like an exhausted, old weathered cousin. I enjoy them so much I find myself drawn to the pantry to partake in a perfect little afternoon treat to go with my tea. Then again, I might meander over after the girls are in bed fast asleep when my sweet tooth hits an all-time high and I’m at risk of ruining the entire day’s healthy eating history in one fell swoop of a spoon in the leftover frosting in the fridge. Yep…a date (or sometimes a few) usually assumes the risk. I feel satisfied, fulfilled and the temptations are tamed….momentarily…. by the Medjool dates! Why is it that FOOD so often serves as a metaphor of something more meaningful in my life? Perhaps it’s because I find pleasure in how food nourishes my mind and body. Maybe it has to do with my passion for finding palate pleasing ways to eat real-whole foods. After all, God gave me a wonderfully tasty, succulently satisfying way to nurture the body He gave me! Here’s how I see it: Every day, several times, I possess an amazing opportunity to explore ways to bless my body with real food. And, of course, to find exciting ways to healthfully fill the little bodies living with me. For me, that’s fun and exciting! Go ahead, call me a food nerd….I’m fine with that. Whatever the reason, I so often find sweet and savory lessons in the way I feed myself and my little family. So when I found myself repeatedly tempted to snitch a natural, sweet, chewy date it made me wonder how often I long for the Lord. Am I being drawn to Him during the day in the same way food calls my name, tempting and taunting me? Or am I shutting His calls out in the name of fitting all my tangible to dos into my time constraints? It’s easy to do, really, because we live in this world where we see everything as tangible, physical and fleeting. But if we build the spiritual into our days, into our habitual ways, this world and the way we nourish ourselves will mean so much more! So, what did I do? I put a reminder on the side of my Medjool Dates. A sticky note that simply says: Pray. And now those natural little Medjool dates offer me even more! Now if you decide to give this recipe a try, mentally attach it to a prayer of thanksgiving because God’s blessing your body with simple, sweetly dressed up Decadent Date! Yes, yes…a normal 3.5 ounce serving of Medjool dates packs a potassium punch to help regulate your body’s electrolytes while a special type of insoluble fiber will keep you ‘regular’ (if ya know what I mean). But it’s their taste and texture I’m mostly tempted to! I love them all alone before a workout or when one of my sweet teeth calls. However, this easy recipe dresses one of my favorite natural sweet treats right up….serve as a decadent dessert, they’ll get your taste buds dancing. If you have a double broiler (I have one that looks sorta like this), put a small amount of water into the bottom pan just so it touches the bottom of the top pan when inserted (careful NOT to get any water in the top pan where chocolate will be..water ruins chocolate). If you do not have a double boiler, simply set a small pan into a larger one with water, careful, again that the water does not get into the top pan. Put the chocolate and coconut oil into the top pan and put heat on low. Allow the mix to melt, stirring occasionally. In the meantime, slice the dates long ways. 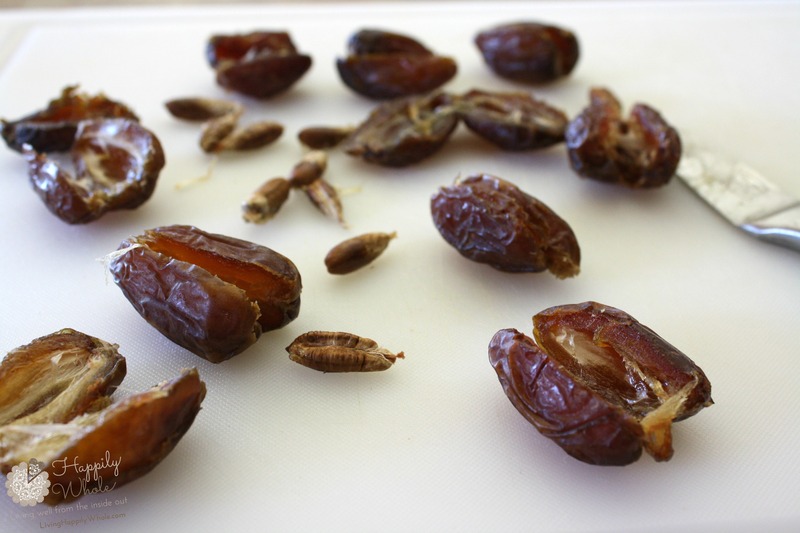 (see picture of sliced dates) and remove the seed. 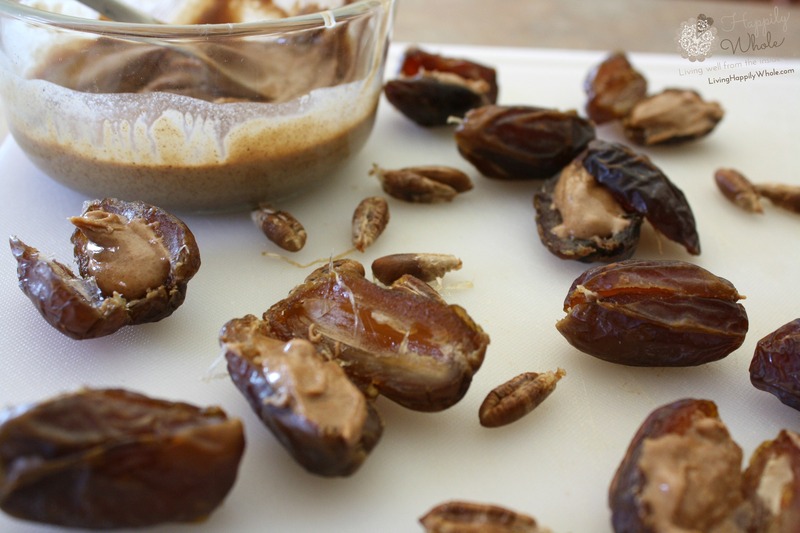 Fill one half of each date with about a teaspoon of almond butter. Put the other half back on. Prepare a cookie sheet or surface with waxed or parchment paper near the pan with melting chocolate as you will set the dipped dates there. Once the chocolate is melted, gently dip the date into the chocolate. I use a small tongs. Set the dipped dates on the waxed or parchment paper. Optional: lightly sprinkle the tops of the dates (still wet chocolate) with a coarse salt such as Celtic Sea Salt). This makes them so much more delicious! 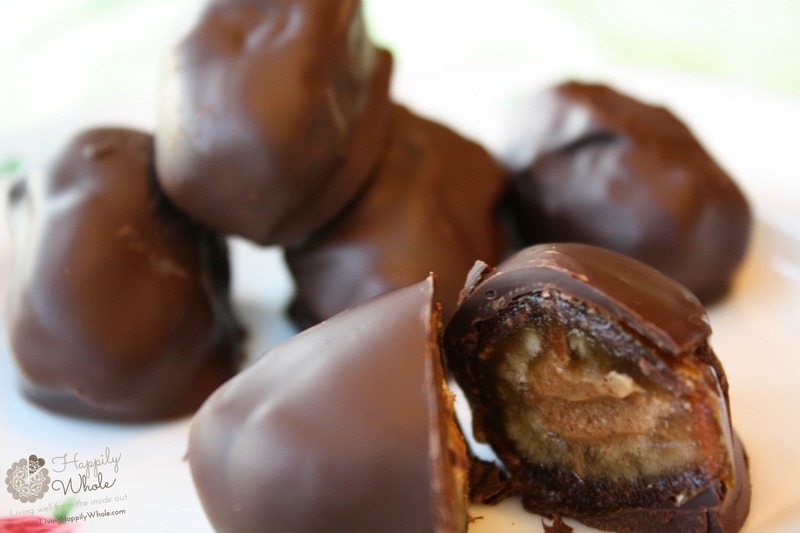 You may put the dipped dates in the fridge or freezer to harden the chocolate faster. Keep in fridge until ready to enjoy! *I used Enjoy Life Dark Chocolate Chips I could find for the pictured recipe here. But, you can easily purchase a couple of good quality, organic dark chocolate bars and chop them. I like to use 70% cocoa content or more to minimize sugars and maximize antioxidants. Buy my recommended cholocate chips here. **Almond butter--this is a topic for further discussion. But, I most often make my own buy purchasing RAW almonds, lightly roasting them and sticking them in the food processor until they turn to a butter (I will do a post on just that in the future). If you purchase your almond butter, be sure it's creamy and contains ONLY almonds and possibly a little salt. You need NOT buy butters containing added sweeteners or oils.